Bows for stringed instruments are generally made from hardwood sticks with a wooden 'frog' at one end where the player holds it. A small hank of horse hair is stretched from the frog to the tip. A sticky substance called rosin is used to make the hair grip the strings of the instrument and force the vibrations from it. 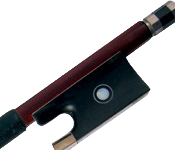 The Bow plays a vital part in the sound produced by a violin, viola, cello or bass. So it is important to select a bow compatible with the payer's style and with the instrument being used. The weight of the stick affects the feel of the bow in the player's hand as well as the tone of the instrument. 60g is a common weight for a good full size violin bow.